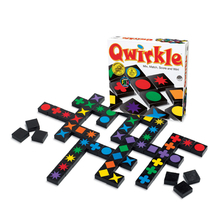 “Qwirkle” is a great games for ages 6 and up. It’s as simple as matching colors and shapes, but this game also requires tactical maneuvers and well-planned strategy. Earn points by building rows and columns of blocks that share a common shape or color. Look for opportunities to score big by placing a tile that touches multiple pieces with matching attributes. The player with the most points wins! 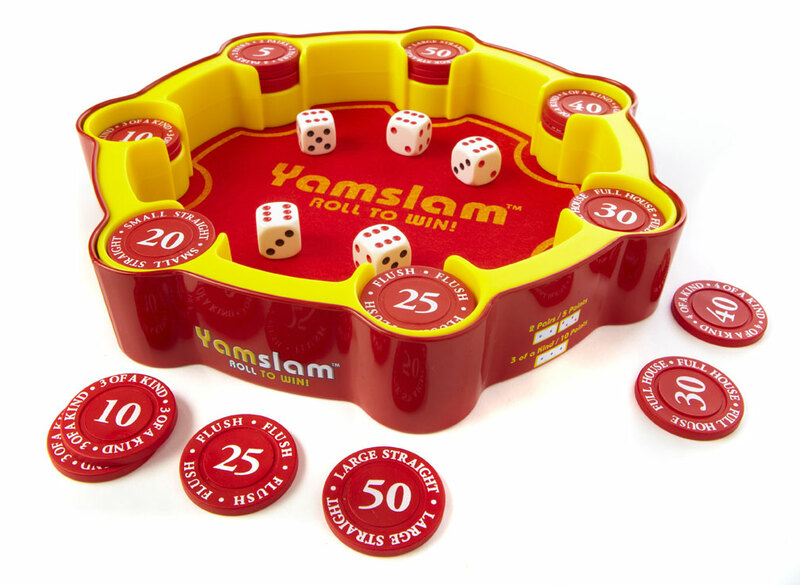 Let the five dice roll you to a win with “Yamslam”! Calculated risk and smart strategy will place the odds in your favor. Roll the dice and choose those that will get you the best results. Each combination has a different point value but only 4 corresponding chips, so get the best ones before they run out! Race your friends to the special bonuses and keep the suspense rolling until the end with Yamslam! Let the good times roll to Yamslam! Yamslam is for ages 8 and up. Kids often feel anxiety playing competitive games. That is why we recommend cooperative games for 3 year olds. A cooperative game is a game where all players play together against a common obstacle, not against each other. In a cooperative game no one feels left out and everyone has fun! Peaceable Kingdom’s cooperative board games use familiar game mechanisms – spinning a spinner, matching cards, moving a token, strategizing a win! The difference is that players play together, thus experiencing shared decision-making, building self-esteem, learning to share, and working as a team. Playing cooperative games teach kids to cooperate. With cooperative games, the stress of losing or not being good enough goes away because players are playing as a team against a common obstacle and not against each other. “Count Your Chickens!”™ eliminates stress, empowers a young learner, and teaches kids that playing together can be fun! Kids practice counting and cooperation. Help your kids learn at an early age how easy it is to cooperate! 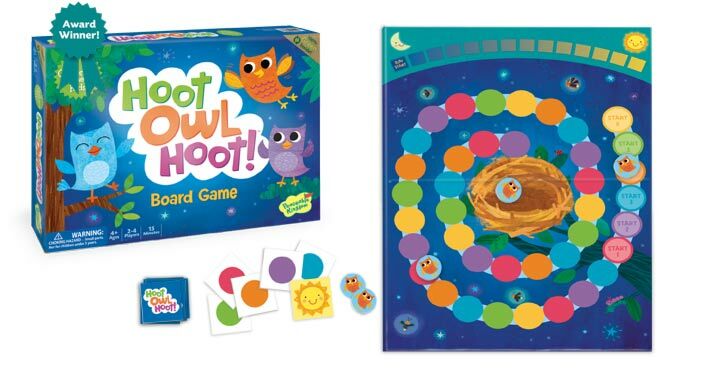 “Hoot Owl Hoot” is a color matching game that emphasizes playing together and decision making. The object of the game is to move all the owls from start to the nest before the sun rises. Posted in Uncategorized. Comments Off on Thanksgiving games…. Thanksgiving is a wonderful time to spend quality time with family and friends. After a delicious meal, what could be more fun than settling down and having a game night! It’s a great way to engage everyone and enjoy each other at the same time. 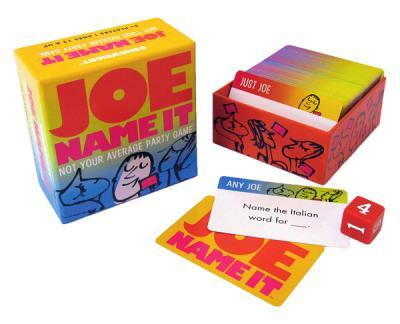 One of our new favorites is “JOE NAME IT” by Gamewright, for ages 12 and up…..Can you name a movie with 2 sequels? How about a music group with 3 members? Test your numbers know-all in this fast-playing “name it to claim it” party game. Draw a category card and then fill in the blank with the number you rolled. Be the first person to name something that fits and you’re smarter than the average Joe! 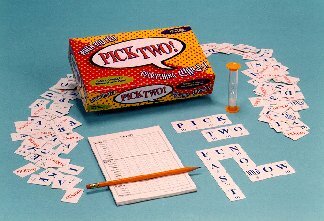 “PICK TWO!” is our all time favorite word game for ages 8 and up.. It’s fast and fun and challenging! In “Pick Two!” each player draws letter tiles, building their own personal crossword as fast as they can. Whenever players use all their letters they yell “Pick Two!” and everyone draws two more tiles. The catch? These tiles must now be added to the crossword. The best part? You can change your crossword by rearranging letters and even words to use up your tiles. When the center tiles are gone, the first one done wins. “Doodle Dice” by Jax is for ages 6 and up. Create a doodle with a few rolls of the Doodle Dice. There’s a different doodle pictures on each card in the deck. When you build a doodle that matches one of the cards, you take that card. Block an opponent’s turn or take one of their cards away. Collect one card of each color and you win! It’s the fun challenging way for everyone in the family to be a doodle artist, and it’s so much fun! Stay tuned for more ideas in the coming days!